The Gospel of St Mark, chapter 9: 14-29, challenges us to ask ourselves the question “How does the effective disciple of Jesus live his or her life?” Clearly the ineffectiveness of Jesus’ disciples in doing His work is evidenced when the father of the possessed boy complains to Jesus that His disciples were unable to help his son, and even questions the power of Jesus to intervene on his son’s behalf. Jesus responds with disappointment tinged with anger over the actions of some of His disciples; people who took it upon themselves to act in Jesus’ name but were not prepared to do so – for they did not ready themselves through prayer, fasting, and good works. Jesus was upset with them for their lack of preparation. He implies that they were not effective co-workers. They were not ready to share His mission because they believed they could remain who they were and still carry out the work of Jesus. At that point in Christ’s ministry they didn’t realize that they had to be willing to cooperate with Him and transform themselves into His Life; a transformation, which accompanied by the grace of God, demanded great effort on their part. This is such an important point, for we must make room for God deep within ourselves. As spiritual people we must guard against the weakness evidenced by the disciples in this Gospel. They thought they were acting like Christ, they thought they had His power in their lives, but they had not made room for Jesus in their hearts, and when faced with the enemy they were unprepared – they were helpless and impotent. So, as creative people – as artists in our various fields – how do we become effective disciples of Jesus Christ? I believe our effectiveness is based on four concepts: 1) the grace of God coming to our hearts and souls through Christ’s Holy Sacraments; 2) our willingness to open our hearts and allow God to go deep within our souls so that He may evangelize us; 3) our personal effort to be transformed into His Gospel Life through prayer, Scripture study, and our unique approach to the creation of sacred art; and, 4) our faith and trust in His ability to lift us up, like the possessed boy, out of our suffering – or to give us the strength to bear what we are asked to endure. These four concepts have an important part to play in our creativity and productivity as sacred artists. We must see ourselves, and the various arts that we produce, as part of His divine mission to first, evangelize ourselves, and then, through our art, those around us. As we approach Ash Wednesday and the first week of Lent, I would like to raise your attention to a series of posts that I will publish during Lent dealing with the idea of prayer as it applies to our creativity. 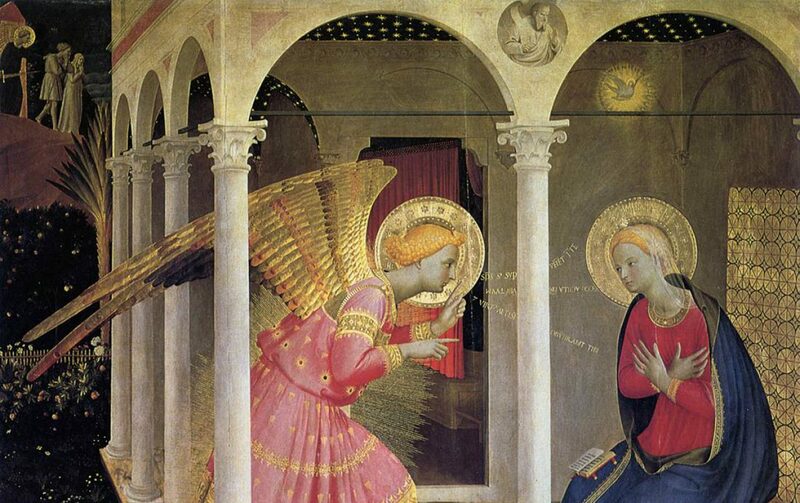 I will explain and explore with you a few valuable methods that I have learned over the years and one that I have recently been made aware of by a fellow member of the Fra Angelico Institute for the Sacred Arts. I pray that you will profit from these upcoming posts and that they may help you in your process of becoming an effective disciple of Christ and an even more creative and Spirit filled person! May the Lord bless you with a happy and creative Lent.